Keep your home smelling fresh and clean with True HEPA Filters! Air never felt so pure with VEVA Advanced Filters. ► BOOST YOUR AIR PURIFIER - We use the highest quality materials to help you get the most of your Unit. The True HEPA filter and Pre-filters are made thicker and more absorbent. Working in combination to improve the overall indoor air quality of your home. ► FASTER INSTALLATION - These are perfectly cut and specially designed to fit Air Purifier Models AC4300BPTCA, AC4900CA, AC4825, AC4850PT, Model AP2200CA and BXAP148. 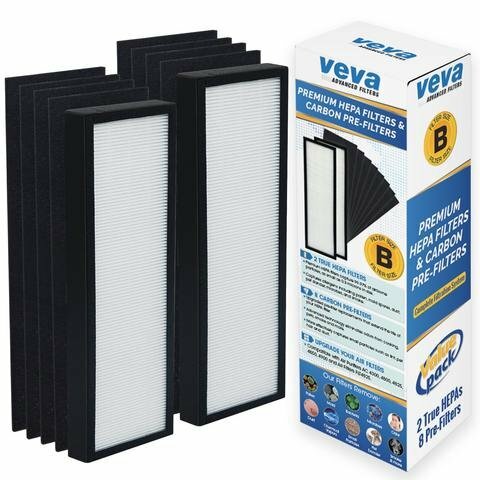 HEPA Filter: H: 15.75" x L: 4.72" x W 1.1" and Pre Filter: H: 15.75" x L: 4.72" x W 0.2"
► UNBEATABLE VALUE - Get more for your money and save with VEVA. With each HEPA filter in each pack, you will have 6 additional pre-filters to soak up those nasty odors, smell, and smoke. Each pre-filter will increase the life of your HEPA filter, so you get more of each one you use. This is a generic product designed and engineered in the United States by VEVA. We are not affiliated with, sponsored by or associated with any OEM brand names and logos are the registered trademark of their respective owners and this OEM product is not covered by their warranty.